Gynecology and Obstetrics Clinic „Kuzmanovic Practice“ began to work in March 2010. Following the creation of technical conditions and obtaining the decision of the Ministry of Health of the Republic of Serbia No. 53-00-00025/2010-02 of 23.02. 2010th and registration in the Register of economic entities Decision No. 25697/2010 of 08/03/2010. met the legal requirements for independent work practice. Professional and legal carrier sent to the „Kuzmanovic Practice“ is Raduša Dr Kuzmanovic , specialist in gynecology and obstetrics. Six-year experience of Dr Radusa Kuzmanovic work of physicians in primary health care and gynecological specialist 11 years experience as an excellent basis for independent work. 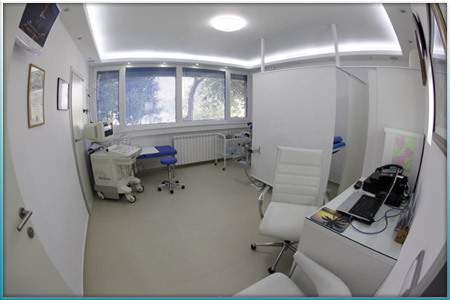 View of the fact how important women's health for her alone, her family and society as a whole, „Kuzmanovic Practice“ wants to provide quality service adhering to the research on the latest algorithms that are regularly updated in the Continuing Medical Education Medical Faculty in Belgrade . Practice in a beautifully landscaped area has the latest gynecological chair brand Olsen, Pro Logic 400 ultrasound machine with three probes and colposcopy Zeiss brand. Made the hair trail for access to children's wheelchairs and people with special needs.